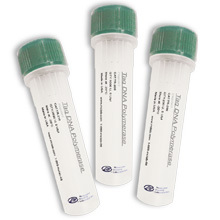 The MCLAB's Fragmented DNA End Repair Kit is used for repairing fragmented DNA by sonication, nebulization or nucleases. 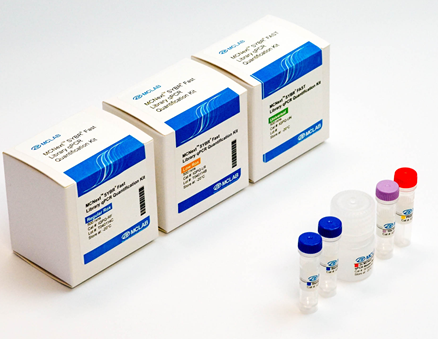 The MCLAB's Fragmented DNA End Repair Kit is used for repairing fragmented DNA ends by sonication, nebulization or nucleases. The kit has been optimized to the maximum efficiency and convenience in DNA sample preparation workflow for next-generation sequencing (including Illumina® Genomic DNA Sample Prep protocol, Roche 454TM Library Preparation and Life Technologies SOLiDTM Library Preparation). The superior function of the Fragmented DNA End Repair Kit depends on MCLAB's proprietary enzyme systems. Unique improvement to each key enzyme increases sensitivity, flexibility and speed to next-generation sequencing. The DNA fragment is converted to the blunt-ended DNA with a 5'-phosphate. DNA repaired by MCLAB's Fragmented DNA End Repair Kit can be used directly for blunt end cloning or blunt-ended adaptor ligation, or be converted to DNA with 3´ dA-tail (MCLAB dA-Tailing kit, Cat #: NGDT-100) for subsequent ligation (MCLAB DNA Ligation kit, Cat #: NGDL-100). 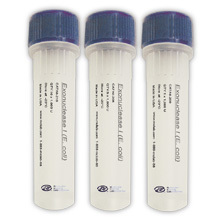 Sufficient reagents are supplied in the Fragmented DNA End Repair Kit to convert 20 or 100 fragmented DNA samples to 5´-phosphorylated, blunt ended DNA.